Thousands of poppies will fall to the ground as the Royal British Legion’s Poppy Appeal is launched in Peterborough tomorrow (Friday). Dignitaries from across the county will come together to mark 100 years since the end of the First World War, and launch the 2018 Poppy Appeal. 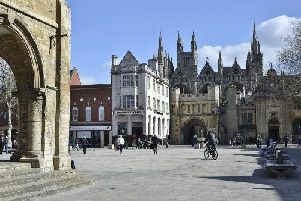 At 10.40am, a procession lead by The Mayor of Peterborough, military personnel, The Royal British Legion, and other dignitaries will leave Peterborough Town Hall and march up Bridge Street, along Long Causeway and into Queensgate Shopping Centre, where a stage is set in Central Square for the historic ceremony. Commencing at 11am, the opening speech will come from the Centre Director, Mark Broadhead followed by a welcome from The Mayor of Peterborough, Councillor John Fox and words from Squadron Leader Stewart Shaw from RAF Wittering to says prayers and read the Ode Of remembrance. A bugler will play the ‘Last Post’ followed by a two-minute silence when thousands of poppies will fall silently from the shopping centre ceiling. After, there will be performances from the Nene Park Academy and Queensgate’s Operations Manager and war history author, David Gray. Visitors to the centre can also learn about and listen to video stories from the famous Peterborough Tea Rooms, thanks to Vivacity who has loaned its exhibition to Queensgate for all to enjoy. Visitors wanting to see the ceremony are asked to arrive at Central Square in Queensgate Shopping Centre on Friday 26 October at 10.45am. Services will be held in Peterborough city centre and across the country on Sunday, November 11 at the nation marks Remembrance Day. Civic dignitaries and veterans will be at the Peterborough War Memorial in Bridge Street for a service at 10.45am on November 11. There will be a series of events at Peterborough Cathedral in the lead up to Remembrance Day and on the day itself, including the civic service following commemorations at the war memorial.